An octopus mom guarded her clutch of 160 eggs for 4.5 years in a deep-sea canyon off the coast of California. It's the longest brooding time on record for any animal -- shallow-water octopuses, for example, usually brood between 1 to 3 months. 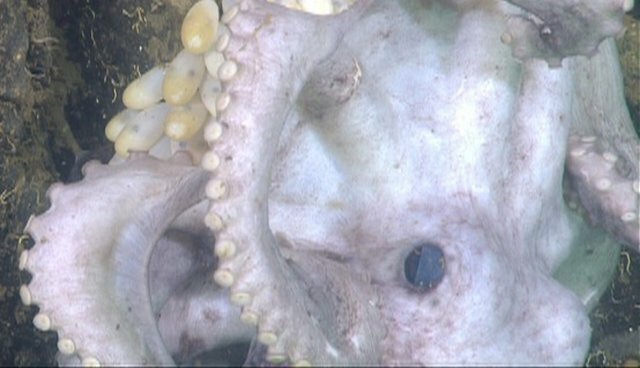 A team of marine biologists from Monterey Bay Aquarium, the University of Rhode Island and the University of Hawaii discovered the octopus in April 2007; the researchers spotted the solitary female crawling toward a rocky outcropping at the bottom of the Monterey Submarine Canyon. When they revisited the spot 38 days later, the scientists saw that the octopus -- now clinging to the rock -- had laid roughly 160 eggs. Over the next 53 months, the biologists returned to the canyon a total of 18 times. The octopus did not stray from her perch (or eat), moving only to fend off the occasional crab with a wave of her tentacle or shift her body. Because the eggs continued to grow over the 4.5 year period, as reported in a new study in the journal PLOS ONE, the biologists conclude the octopus was caring for the same clutch of eggs continuously. At some point between September 2011 and October 2011, the baby octopuses hatched. The 4.5-year-long brooding period, the scientists say, gave the young octopuses plenty of time to grow, making them better equipped to survive the frigid waters nearly a mile below the surface. "These surprising results emphasize the importance of parental care in producing well-developed offspring that can cope with the rigors of the deep-sea habitat," says Bruce Robison, a Monterey Bay Aquarium biologist, in a press release. May 2007: Researchers spot the octopus mom, with eggs, clinging to a rock at the bottom of Monterey Submarine Canyon. July 2007: Harry Potter and the Order of the Phoenix hits theaters. Octopus mom, being a deep-sea cephalopod, does not get tickets. November 2008: Barack Obama wins the U.S. presidential election. Octopus mom guards eggs. July 2009: Harry Potter and the Half-Blood Prince is released. November 2009: The New York Yankees win their 27th World Series Championship. Octopus mom, probably a Giants fan, guards eggs. January 2010: Taylor Swift is awarded a Grammy for her album, Fearless. Octopus mom is unmoved, guards eggs. July 2011: Harry Potter and the Deathly Hallows: Part 2 is released. Octopus mom, once again, does not get tickets. September 2011: Scientists visit the octopus' canyon and, for the last time, confirm she is guarding her eggs. The Occupy Wall Street movement begins. Octopus mom occupies eggs. October 2011: Upon returning to the canyon, the biologists find that all 160 eggs have hatched, but no sign of this dedicated octopus mom.